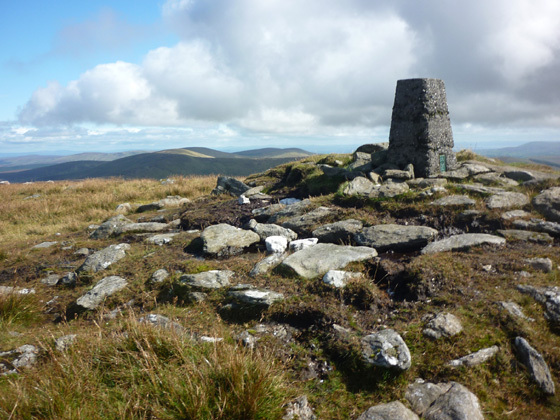 Sawel may not be as exciting or as impressive as some hills in other parts of the country, but it is a special hill among a special range of hills. The fact that it is named after a part of the female anatomy (and indeed looks the part if you see the pic) can only add to the charm! The best approach is along the high and lonely Sperrin road which heads upward out of the hamlet (even this is over descriptive) of Sperrin. Parking is available at an extensive layby at 639944 I. The road rises alongside Oughtnamwella Burn and brings increasingly impressive views over the Glenelly valley. It is most definitely worth the walk but there is also room to park at the high pass at over 1000ft - think of the exercise! From the pass take the fenceline rising up the long E shoulder of Sawel, the going is steady with steeper sections but it is not too challenging and the fence is reassuring in poor weather - it is only near to the summit that need to leave its side and head off a short distance to the rare sight of a trig pillar in the Sperrins. I would challenge anyone (in a duel to near death, preferably with pillows) to tell me that the views from here on a clear day can be beaten by another mountain in Ireland. Basically every county in Ulster is within sight of glazed eyes - at the amazingness of it all and in no way to do with drug use. Where else could you see nearly all of the hills of Donegal and all the way across to the hills of Antrim at the other side of Ireland? 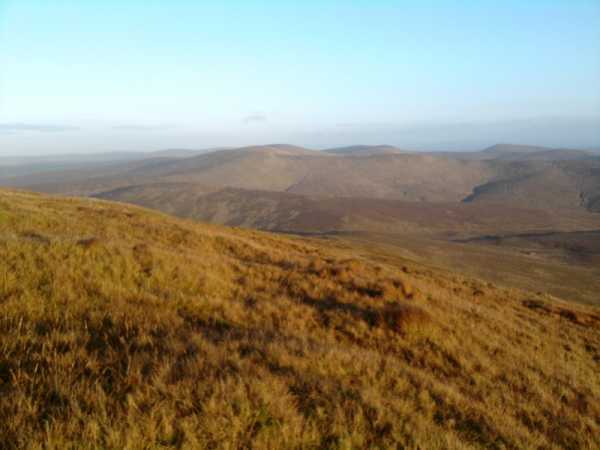 The whole of the Sperrin range is visible in all its glory, and as i have said in another comment this hill could on occasion make me briefly turn away from my steadfast atheism. 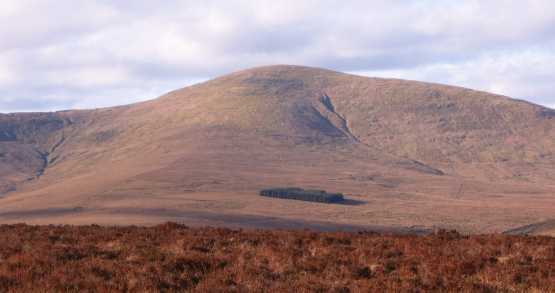 Sawel carries stature in being the highest point of the large Sperrin range and holds the weight of two county tops. For all this it is still a rare sight to see someone else on the mountain, even at the weekend, something that adds to its appeal i feel. 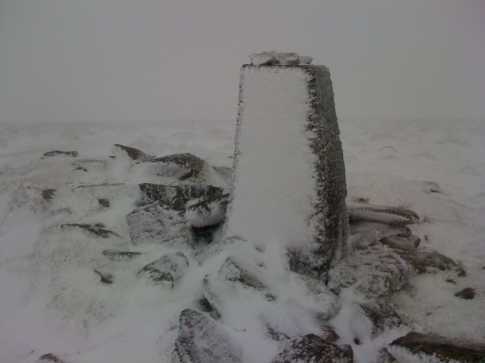 After following the weather forecast to see where we might get in a good winter climb, we settled on the Sperrins which, if the Met Office was to be believed, had apparently received some snow the day before (Fri 26th). Driving into Cookstown we caught our first real views of the Sperrins; they had indeed gotten a huge dump of snow that far exceeded our expectation. We took the first road right on the B 47 after Glenerin Bridge and just before the hamlet of Sperrin. This mountain track leads up towards the foothills of Sawel that was to be our objective for the day. We were almost thwarted in our endeavour by the accumulation of snow on the road and not having a 4X4 and a car without its winter tyres meant it was difficult to find a place to park alongside the road where we wouldn’t get stuck. We found a turning about a kilometre up the road to park safely and walked parallel to Oughtnamwella Burn to 633 952 J where a gate leads into a field that is bordered by a fence. This fence that runs up towards the summit can be used as an aid to navigation in inclement conditions. 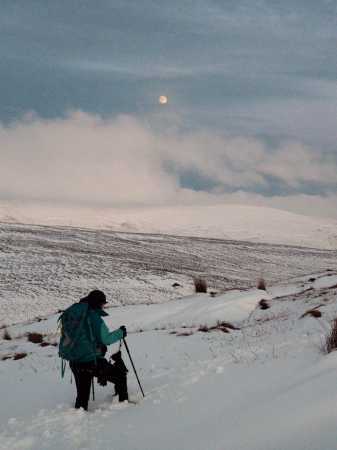 The snow was much deeper than we had thought it would be and we regretted not having our snowshoes with us, which had propelled us rapidly up Lugnaquillia last month. The snow was well over a foot deep and on the lower slopes was quite loose and mushy. Between the peat hags, it had drifted and was waist deep making it hard going to maintain upward progress. As we ascended the snow became more compact and easier to walk on, but the temperature began to plummet. Close to the summit the cloud closed in and the wind picked up, creating poor visibility in sub-zero conditions. We located the trig point, misshapen and contorted by ice, with the aid of our GPS. As we hopped the ice laden fence to bag the highest point in Tyrone, the sinking sun appeared through the swirling cloud as a watery orb, casting an eerie, pale apricot other-worldly hue over everything. It reminded me of the planet LV-426 in Alien! As we were being severely buffeted by icy winds at this point and thankful that our winter kit was repaying the money we had dished out on it in spadefuls, we decided to make our descent. As we came through the cloud we were greeted by the sight of the rolling landscape bathed in the rose-coloured glow of the setting sun. As we feasted our eyes on this spectacle, the near full moon drifted up from behind Oughtmore and Mullaghsallagh.